If you are looking for a quicker way to collect on overdue debts from your customers in Sage 300 ERP (ACCPAC), look no further! Equation Technologies has built a faster, more flexible solution to get your collection letters out and gain the money that you are owed. Cash in on overdue payments with the Automated Customer Collection Letters Solution! While organizing your collection data may be time consuming and probably has you merging data from one system to the next, implementing the new Automated Collection Letters Solutioncan provide you with one seamless way to communicate with your customers and cash in! As all of your accounts receivable data is already held in Sage 300 ERP, take a step back from your current process, and let the system do the work for you. Uses data already in system: The form shown here will automatically retrieve overdue data, highlighting the customer, total amount due and delivery method held in the system based on the customer(s) and cutoff date selected. Allows for flexibility: Users have the option to create 3 separate collection letter layouts for each of the following overdue classes: 30 days, 60 days and over 90 days. 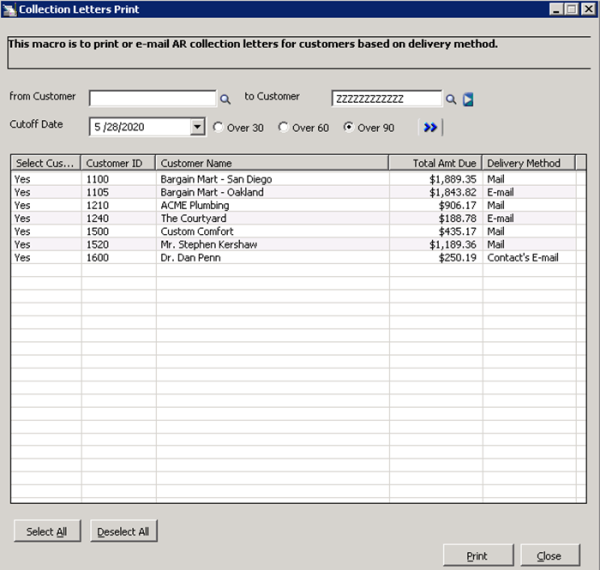 Automates the process, saving time: By simply clicking the “Print” button on the bottom of the page, the system will email the collection letter for those customers who have “E-mail” and “Contacts E-mail” identified as their delivery method as well as print the collection letter for those customers who have a delivery method of “Mail”.